Did you get your fill of Black Friday sales? I got some great deals for gifts and gifts for me ;) I only have a more things to buy and fingers crossed, for the first time ever, I'll have all my decorations up and gifts purchased before December. It makes me really excited to have the next month just for enjoying, baking, and entertaining. Speaking of entertaining, now's the time we start thinking of getting our homes ready for guests. 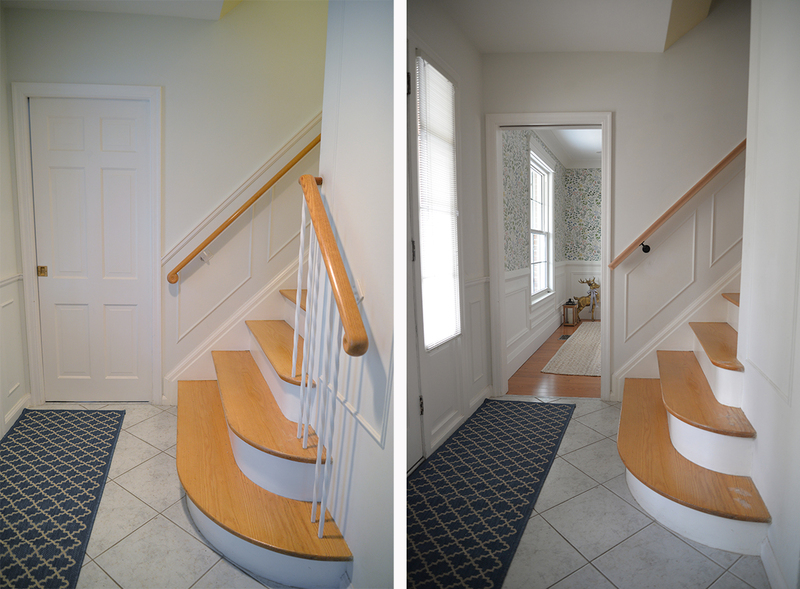 One area we've been planning to give some attention is our stairwell. We've got a few updates in the works and I'm happy to share one of them with you today. Let's be honest. Our stairway looks it was stuck in 1976. 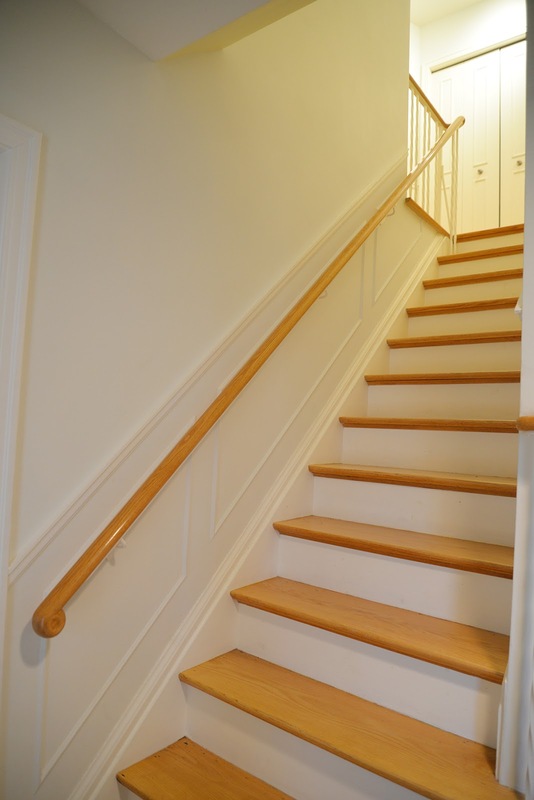 The honey toned wood, the curvy profile on the railing, the thin iron spindles. It completely reminds me of my childhood. And Chloe seems to think of it as a jungle gym. She has a habit of leaning on the railing and tugging on it (seriously, why can't kids just WALK properly down stairs??) to the point where the railing has pulled away from the wall. You can see in the photo above there's a bit of patching that needs to be done. 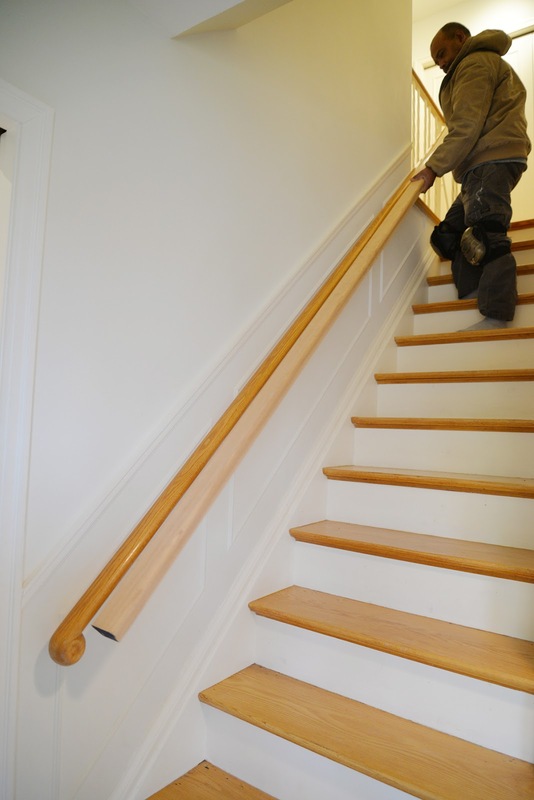 I've never liked the thinness of the handrail anyway, and we never used the railing on the narrow wall, so it was a good reason to get the railing replaced. 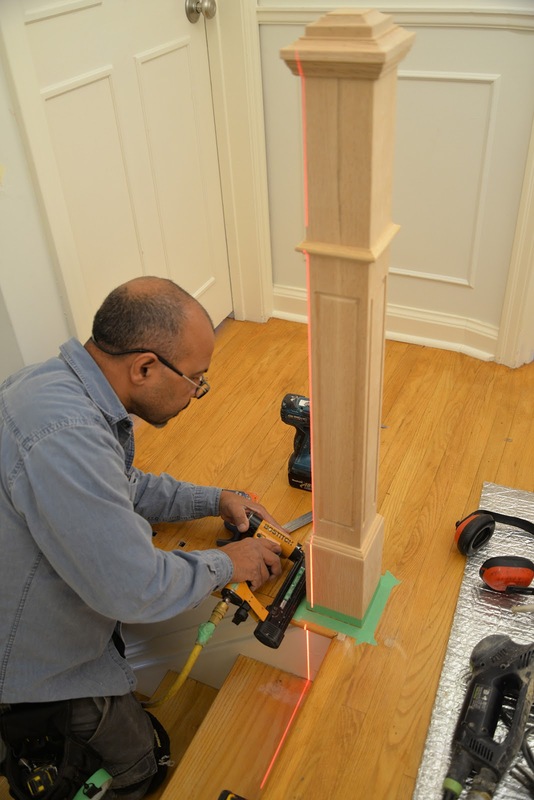 How do you find contractors for your home projects? I always ask friends and family first to see if they have recommendations. When that fails, I turn to online review sites like HomeStars. 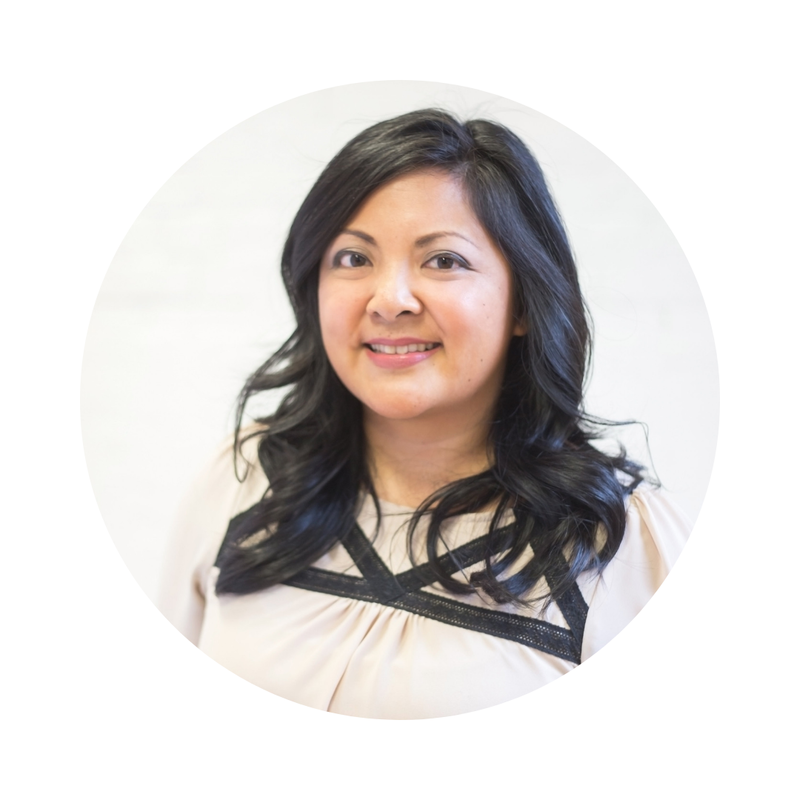 I check out reviews, look at customer photos, and try to find pricing for jobs comparable to mine. That's how I found Leo of Gmano Railings to do our project. We had a few people come in to give us a quote but Leo impressed us with his knowledge and in particular his attention to detail. 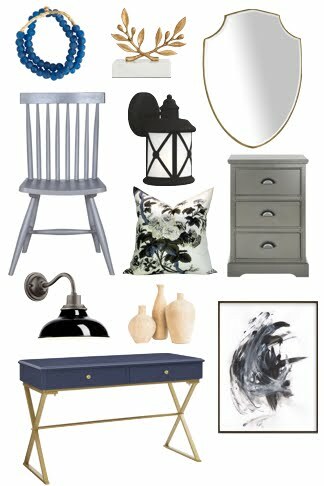 If you've been reading here a while, you'll know we're sticklers for detail! We talked about the profile of the post and the height of the railing. Would the wall moulding be visible? Would the brackets be black or white? How would he treat the old spindle holes? I appreciate it when a tradesperson thinks of things I hadn't even considered. 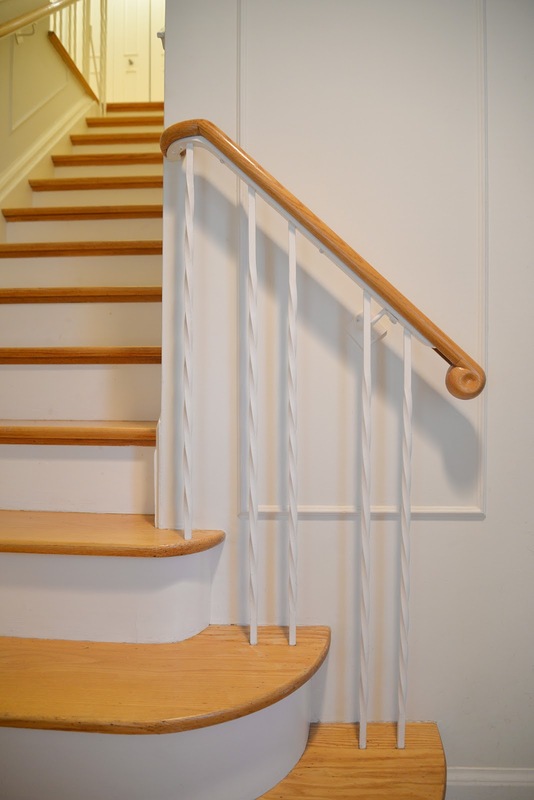 He had lots of photos of examples of his work and photos of different handrail profiles. 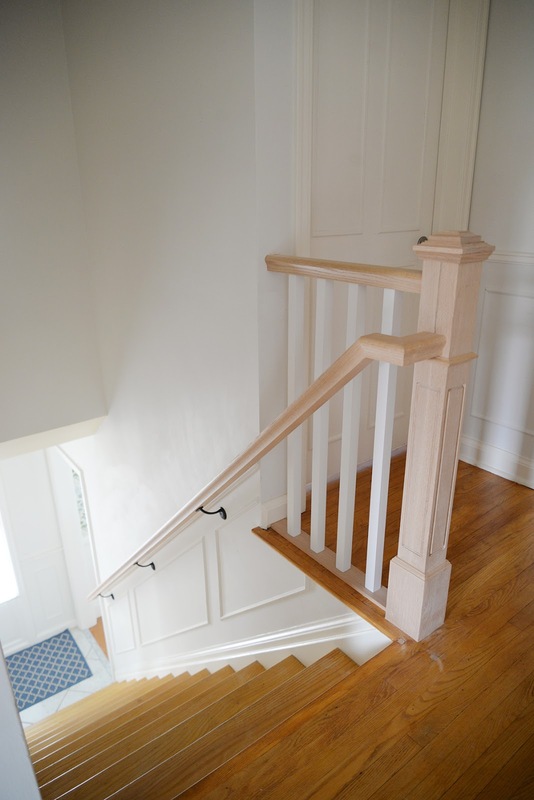 We decided on a traditional post and a thicker, less rounded railing in keeping with the style of our home. Leo arrived and came with a single piece of wood for the handrail (we didn't want any seams) and we decided on placement and how it would meet the post. Then he made quick work of removing all of the old iron spindles. I was happy to see those things go. They were the first things you saw when you walked through our door and they looked really dated. 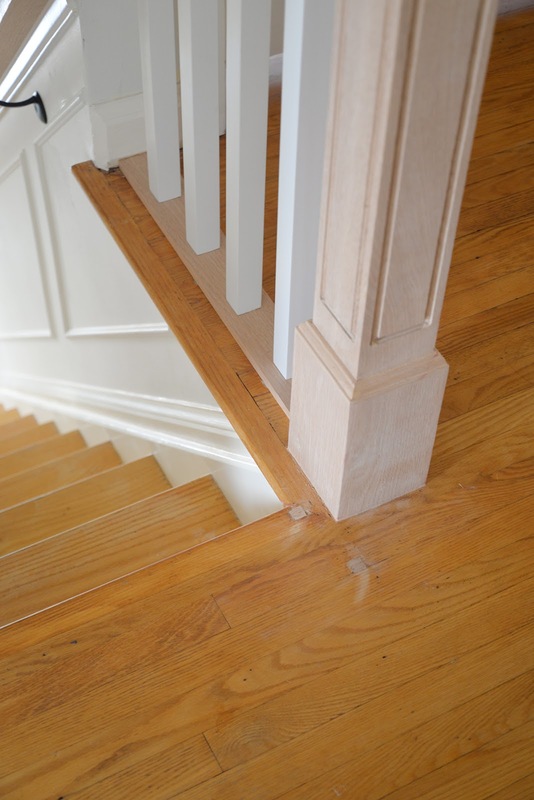 Leo filled each of the holes with a wooden plug which he sanded down to the surface of the stairs. 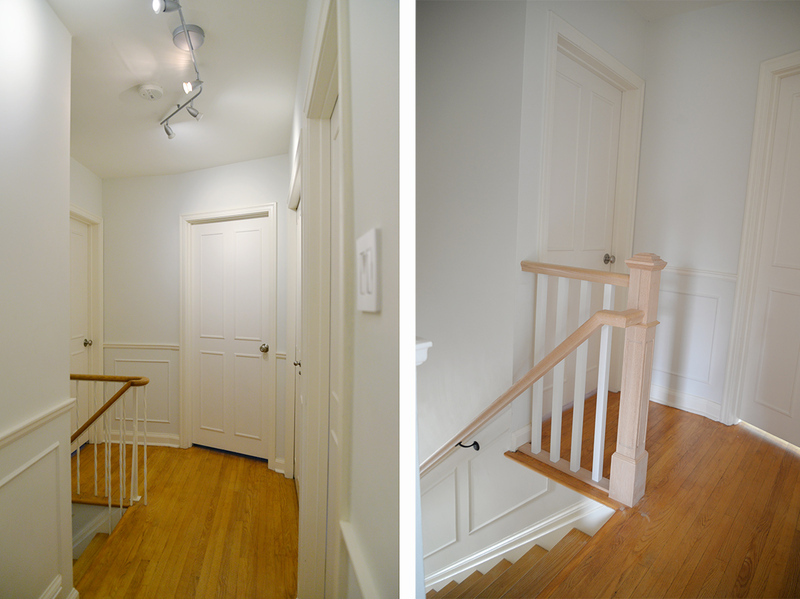 We'll have to decide what to do in terms of finishing (do we get the stairs and matching upstairs flooring refinished?) 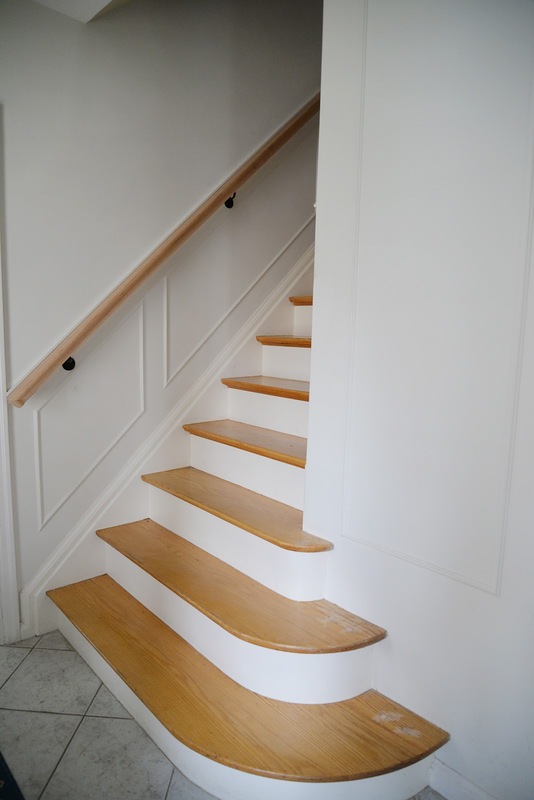 but for now we'll probably just coat the stairs with a varnish to make them blend in more with the old treads. 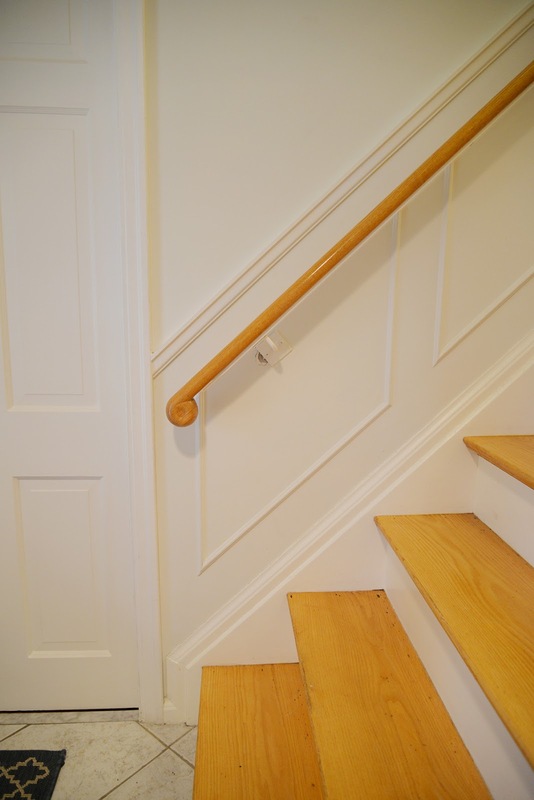 The old upper railing was replaced with a post and balusters. It sits much higher than the old railing (as needed by code) so we've all had to be more conscious about not running into it! 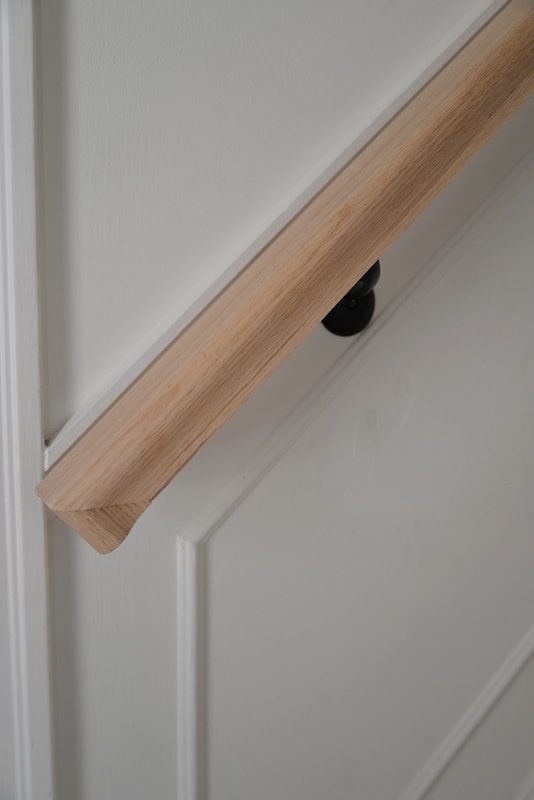 I liked how the details of the new post matched the trim work on our doors and walls. Isn't it pretty? 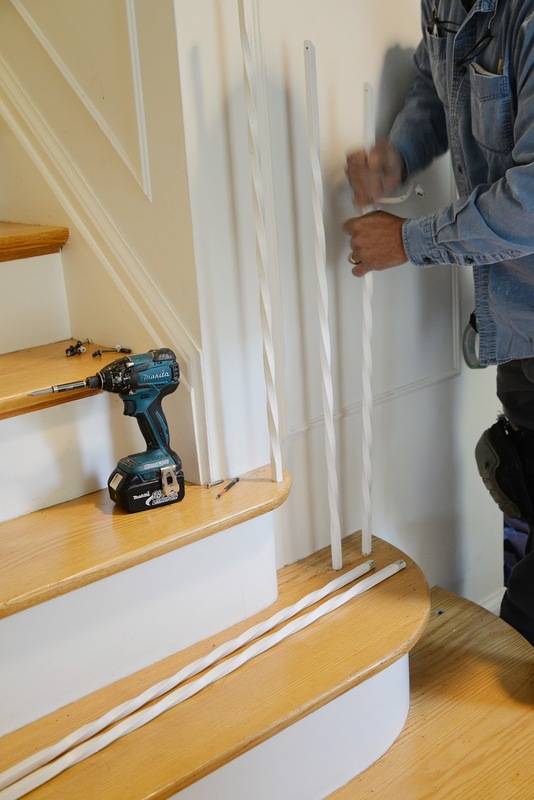 Getting the proportions and placement of the handrail just right is an art and Gmano Railings did a fantastic job. The railing looks and feels so much more substantial than the old railing. You can see where the old holes have been plugged. Leo also put a strip of wood on the floor between the post and wall to hide the other old holes. It gives a much cleaner look. The height of the hand rail fell just where I wanted it, leaving the top of the moulding visible. It was finished off nicely too, with a mitred piece carried around the end. The entire job took about five hours. 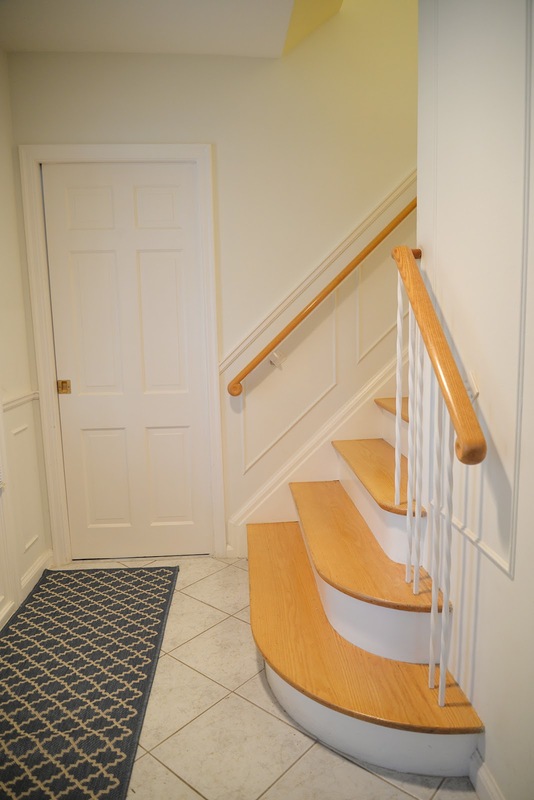 I love how it's given this area a cleaner look and makes our small entry just a bit more spacious. Now to decide if we stain the railing. I'm leaning towards staining it a dark black. But first, there's another change happening in this area - and it's happening next week! More on that to come. Disclosure: This project completed in partnership with Gmano Railings. All opinions and text are my own. Thank you for supporting the brands who make this blog possible.